At any given time, HSLDA’s litigation attorneys are engaged in 10 to 20 cases in an effort to protect parental rights and advance homeschool freedoms. Despite the fact that most courts are notoriously slow, Home School Legal Defense Association’s litigation office is busy filing petitions, complaints, and briefs, and scheduling oral arguments in each of our current cases. This fall there have been several updates in our top three cases. Loudermilk v. Administration for Children, Youth and Families. As reported last month, the district court in Arizona ruled against HSLDA when it determined that two social workers and an assistant attorney general did nothing illegal when they entered the Loudermilks’ home without a warrant by threatening to take the homeschooled Loudermilk children into state custody. HSLDA has appealed this decision to the Ninth Circuit Court of Appeals, and both sides will be submitting briefs to the Ninth Circuit in the coming year. State of Nebraska v. Thacker. Last year, Eric and Gail Thacker were convicted in a lower court of not being in compliance with Nebraska’s compulsory education law because their school schedule did not follow that of the local public school. When HSLDA appealed to the district court, it agreed that the Thackers had not broken the law, and overturned their criminal convictions, as reported previously. On September 26, 2012, The State of Nebraska appealed the district court’s decision to the Nebraska Appeals Court. Ferris v. Hershey Medical Center, et. al. HSLDA is pursuing its lawsuit against the hospital workers and a social services investigator who took Scott and Jodi Ferris’ baby into custody. The Ferrises faced hostile medical staff during Jodi’s postpartum care and lost custody of their newborn daughter when they questioned whether certain medical procedures were necessary. After our original filing of the suit in April 2012, HSLDA has filed an amended complaint, adding specific allegations concerning the conduct of the medical staff which led to the involvement of social services. These cases are essential to HSLDA’s commitment to protect your right to homeschool and the rights of parents to direct the upbringing of their children. 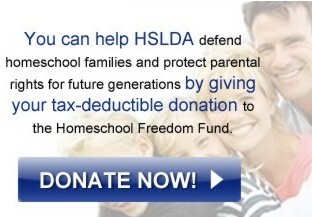 We appreciate your prayers and support of HSLDA in our ongoing litigation.